The Energy Architecture Performance Index (EAPI) aims to help world leaders and inform decision-making by benchmarking the current performance of energy systems of individual nations. Launched in 2013, the 2015 index has evolved to include the latest available energy data from 125 countries, highlighting strengths as well as areas of improvement. 1. Switzerland tops the rankings. Despite being dependent on energy imports, its energy system supports overall economic growth through low energy intensity, a diverse supply mix and diversity of import counterparts. 2. Norway has an energy system characterized by a vast resource endowment, considerable energy export revenues, and a focus on developing renewable energies. 3. France is the highest performer among EU countries, achieving high scores for environmental sustainability and energy access security. The French government is now aiming to reduce its reliance on nuclear energy by investing heavily in renewables. 4. 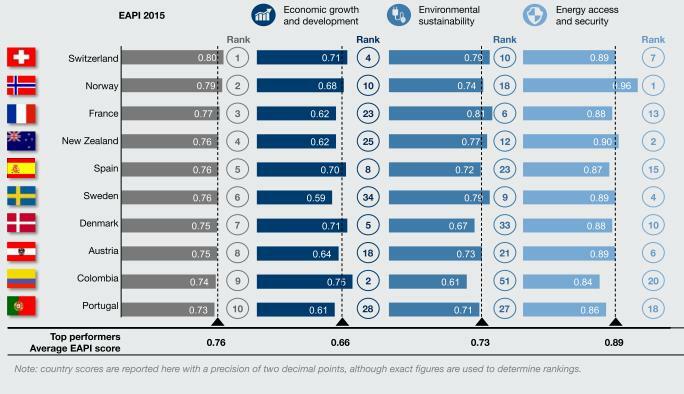 New Zealand is in fourth place in the EAPI 2015, ranking behind only Norway for energy access and security and also scoring high for environmental sustainability. 5. Spain’s performance is based on the high diversity of its fuel mix and import counterparts, as well as high fuel efficiency. However, government support for renewables through subsidies has led to an “electricity deficit” – the difference between the sum paid by utilities to power generators and the amount utilities gain from customers – which the government is now tackling. 6. Sweden has a high share of low carbon fuels in its energy mix, and has further increased its focus on renewable energy. This is reflected in strong performance across environmental sustainability and energy access and security. 7. Denmark aims to become independent of fossil fuel consumption by 2050. This is being pursued through renewable energy, energy efficiency and climate change mitigation policies. 8. Austria has been praised by the International Energy Agency for the extent of its public funding dedicated to energy research, development and demonstration, which has tripled since 2007. 9. Colombia. As the sole emerging economy in the list of top performers, Colombia achieves high scores on energy access and security and economic growth and development. While a direct link between energy reforms implemented in 2003 cannot be inferred, these policies have undoubtedly supported aspects of this performance on the EAPI. 10. Portugal. The restructuring and privatization of former state energy utilities in Portugal has created a grid better suited to the intermittency of renewable energy sources. The Global Energy Architecture Performance Index 2015 is published today.